Do you buy a lot of those air fresheners that you need to plug into an outlet? Many of the products that are found at the store typically have essential oils listed as an ingredient. You may realize it is not easy to find the scent you want. How about make a Clothespin Air Freshener by yourself, so that you can choose the scent and make it healthier? Here is a simple tip that I wish I had known ages ago! You can make a clothespin air freshener in a few minutes. Simply take a wooden clothespin and a few drops of a scent or other natural product you love. Rub the scent onto the clothespin and let it soak into the wood. 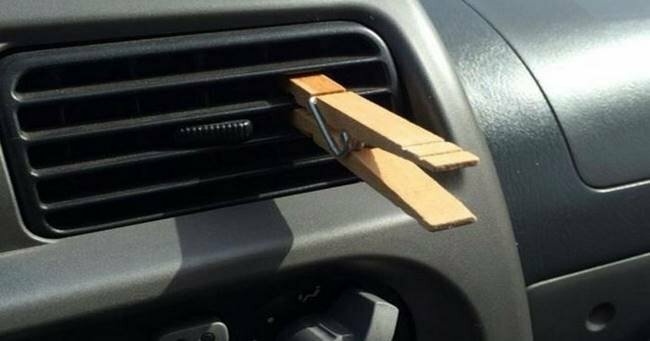 When it’s done you can clip the clothespin onto in your car or any type of vent. When the smell begins to fade, simply drop or rub more oil onto the clothespins whenever you’d like. A clothespin air freshener is easily one of the best, most cost-effective ways to make an area smell good.